"When People Can See Time"
View the full Day To Night Collection here. This column is about “The Beatles - 6 Days That Changed the World February 1964,” photographic evidence of the late Bill Eppridge’s crazy, fun week with the Fab Four and their fans in New York and Washington, with a couple of wacky train rides to boot. But it’s also about music, memory, history and the role of photography, the scientific process that someone with an eye, interpersonal skills and degrees of luck can use to make artful journalism. Dozens of photos from the 90 rolls of film Eppridge shot that week are beautifully hung on the walls in the Art Gallery in the Visual & Performing Arts Center at Western Connecticut State University’s Westside Campus. The hours are Monday through Thursday, noon to 4 p.m. and weekends from 1 to 4 p.m. It’s a tour de force that runs through March 13. He’s represented by the Monroe Gallery of Photography in Santa Fe. Grandmothers will remember being teens and tweens. Forty-somethings may contemplate the changes the Beatles wrought to music and culture. And millennials can discover a simple slice of 20th Century social phenomena without the chore of too much reading. My favorite photo was captured outside The Plaza Hotel in New York. An amused black-clad chauffeur is trying to unload The Beatles’ baggage in a scrum of girls. One kid, with a huge smile, is hugging a guitar case as if it were Paul McCartney himself. If she was 14 then, she’s 66 now. Every time I look at the image it makes me laugh out loud. Eppridge, a famous photographer for Life magazine and Sports Illustrated, died in Danbury about 2 1/2 years ago at 74. When President John F. Kennedy was murdered in November of 1963, Eppridge was with mountaineers in the Alps. He came off Mont Blanc, the tallest in Europe, where a local priest told him of the assassination. In just a few years, as the sassy ’60s unwound in violence and cynicism, he would get extremely close to another Kennedy murder. On the morning the Beatles landed, Feb. 7, Eppridge got the assignment to meet them at the newly renamed JFK International Airport. A welcome relief after the president’s murder less than three months earlier, the lads from Liverpool were met by thousands of teenagers. Eppridge called his editor and said he wanted to stay with the band for a few days. In the winter of 1964, the United States needed The Beatles and their pop harmonies. On Sunday night, Feb. 9, they took “The Ed Sullivan Show” by storm. Monday, Feb. 10, was a nasty, cold rainy day in Stamford. It was so horrible that the runny-nosed masses at Belltown School — usually confined to the playground in all weather until school started — were allowed inside, to line up on a stairwell, dripping wet, to await the 9 o’clock bell. All the fourth-grade chatter was about The Beatles appearance the night before and who might be a kid’s favorite. Alas, we were a “Disney” family on Sunday nights, watching wholesome entertainment on another TV network, rather than the usual cavalcade of nightclub comics and crooners that Sullivan trotted out every week for CBS. I knew nothing about the Beatles, was drastically behind the pop curve and never really caught up. Maybe that’s why I’m a contrarian newspaper reporter. Of course, I eventually found the Beatles and their poppy tunes and startling harmonies. You can easily catch their Ed Sullivan appearances on the Internet. Those first 13 minutes, with “All My Loving.” “Till There was You,” “She Loves You,” “I Saw Her Standing There” and “I Want to Hold Your Hand” say almost all you need to know about the innocent, early ’60s. “Anything was fodder for the camera with Bill,” recalled Adrienne Aurichio, Eppridge’s wife and collaborator, who held a gallery talk the other night at WestConn. Among his 900 assignments were Dr. Jonas Salk, who defeated polio, actress Mia Farrow, President Lyndon Johnson, Woodstock, Barbra Streisand and Vietnam. In a way, the Beatles were a welcome respite as the remainder of the ’60s played out. By the fall of 1964, Eppridge was practically living with a couple of heroin addicts for Life’s stark, harrowing, graphic “Needle Park” report on drug users at 72nd Street and Broadway. Maybe in 50-plus years we haven’t really evolved too much, as the latest heroin epidemic plays out. Eppridge is most famous for the iconic image of Robert F. Kennedy dying on the floor of the Ambassador Hotel in Los Angeles, a bus boy by his side, after winning the California presidential primary in 1968. The murder occurred two months after the assassination of the Rev. Dr. Martin Luther King Jr. The ’60s were surely over. Last week, RFK’s killer, Sirhan Sirhan, now 71, was denied parole for the 15th time. 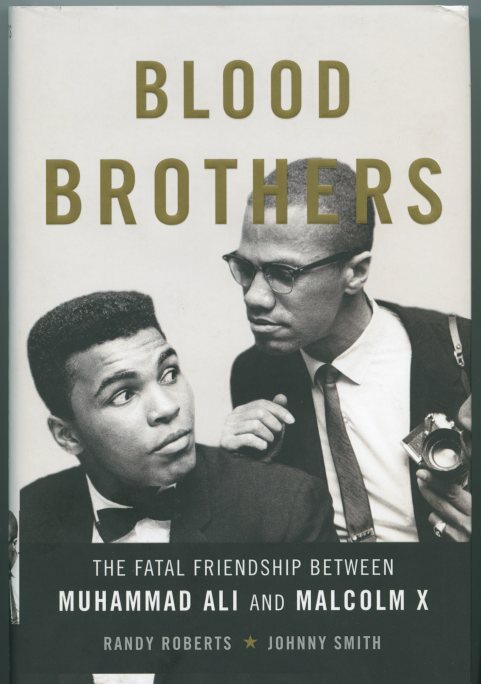 Bob Gomel's Photograph on the cover of the new book "Blood Brothers"
Bob Gomel's photograph of Cassius Clay (Muhammad Ali) and Malcolm X is on the cover of the new book, "Blood Brothers".